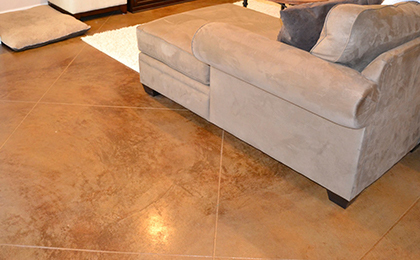 Stain-Crete is a permanent concrete floor stain that creates beautiful color tones in existing concrete. 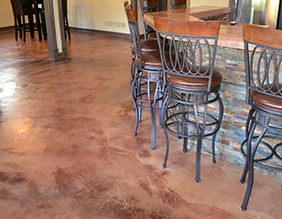 Stain-Crete reacts chemically with cured concrete to provide a distinctive, permanent color with a rich variegated finish that will not peel, crack, chip or fade. 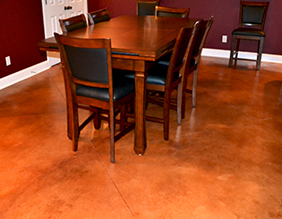 Stain-Crete is ideal for exterior and interior custom stained concrete. 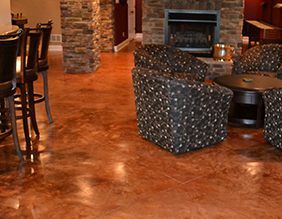 The design options of Stain-Crete are endless. We can create any pattern or color combination you can dream up - or we can help you make color and design choices that will complement the décor of your home or business. Total flexibility and endless design freedom. Impervious to salts and salt spray, alkali, ultraviolet rays and abrasion. An affordable alternative to tile.